Informative, engaging, extensively researched and referenced (with both a detailed bibliography and also a very much appreciated subject index), Matthew A. Bille's Rumours of Existence is basically and for all intents and purposes a realistically conceptualised, scientifically sound exposé detailing mostly newly, read relatively recently discovered animal species (from minute living fossils to the giants of the sea, to whales and other cetaceans). And please do note that Rumours of Existence is (and indeed thankfully) NOT (as some reviews on Amazon seem to claim) promoting and featuring elements of so-called cryptozoology, and while there does exist a chapter on what the author labels mystery animals, even this section, while indeed somewhat more speculative (as that is the nature of the beast), is nonetheless bound to realism, to science and research, and not myth and folklore (the possibility of giant eels, pigmy elephants and curious, strange felines are seriously considered, but Thunderbirds, the Loch Ness Monster, Sasquatch and other such pseudo-mythical creatures do fortunately not make an appearance). 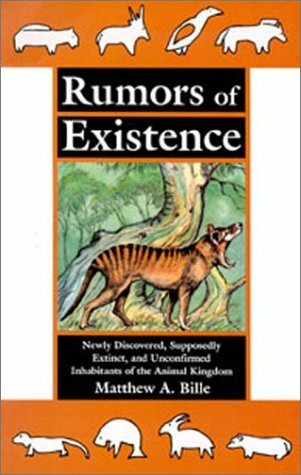 Now the only small caveat I can possibly give is that due to the fact that Rumours of Existence was published in 1995, some of the information presented and featured is likely (and even more than likely) a bit out of date (I do know for a fact that with regard to the featured animals presumed extinct, there have been a number of both positive and negative changes since 1995, with some animals now absolutely considered to definitely be forever gone, while others are actually making a bit of a comeback). Highly recommended and for me, personally, Matthew A. Bille's Rumors of Existence is definitely the best and most approachable book on newly discovered animal species I have read to date (a science-oriented tome that strikes a delicate and successful balance between imparting knowledge and research, and achieving this in a manner that even interested non experts, that not just zoologists, biologists, that scientists with advanced degrees can easily and with retained interest understand and appreciate). Absolutely fascinating!! A must-read for anyone interested in natural history!! Just a comment from the author. There is a little material in this 1996 book that's now dated, but there's not much. The stories of discovery in this book are still exciting, and most of the mysteries are as mysterious as ever. An interesting example of one that's been solved is what I called Forney's whale, an unknown beaked whale based on an eyewitness report by mammologist Karin Forney. As I wrote in the follow-up, Shadows to Existence (2006), Forney's whale subsequently stranded and was described. Science at work! I hope you enjoy the book. This is a jewel of a book—it's sooo interesting! The first part deals with animals that have only recently been discovered, including large animals that it's hard to believe were unknown for so long. The most interesting, even though most people already know about this, is of course the Coelacanth. Coelacanths went extinct millions of years ago. The fossil record stopped. Except that whoops, one swam into a fisherman's net in 1938. These are true, primitive fish—they have a joint on the top of their skulls, and they have a notochord filled with oil instead of a backbone. Coelacanths are lobe fishes, which are believed to be the actual ancestors of amphibians (who then gave rise to the reptiles, birds, mammals—and eventually man). There are over twenty chapters on these recent discoveries.Part Two is animals which are presumed to be extinct—but which might not be. Either people claim to have seen them, or other evidence (feathers, tracks, calls) is found. Some of these are Steller's Sea Cow (discovered in 1741 and all killed by 1768), and the Ivory Billed Woodpecker (the 2+ foot strikingly colored woodpecker was the largest ever in the US). The most intriguing to me is the Thylacine, or Tasmanian Tiger. While the last known specimen died in 1936, rumors abounded so they weren't officially declared extinct until 1996. But thousands of people claim to have seen them over the years, so...Interestingly, just today I read an article that it's possible that there is a population in Australia. Enough evidence exists that game cameras are being set up to try to capture them on film!The last part of the book deals with animals that may or not have ever existed—some huge, like the giant eel , the giant octopus, or the Kamchatka Giant Bear, and some small, like the Snake Mackerel, Steller's Sea Monkey (unlike Steller's other discoveries, no one else ever saw this creature), or the Long-Snouted Moth. I especially enjoyed the chapters about mysterious cats, including the Onza, which resembles a leggy, slim panther, and the Marozi, which resembles a lion except with jaguar-like spots.Intriguing book that I enjoy periodically re-reading!